Creative DIY Decor... and More. 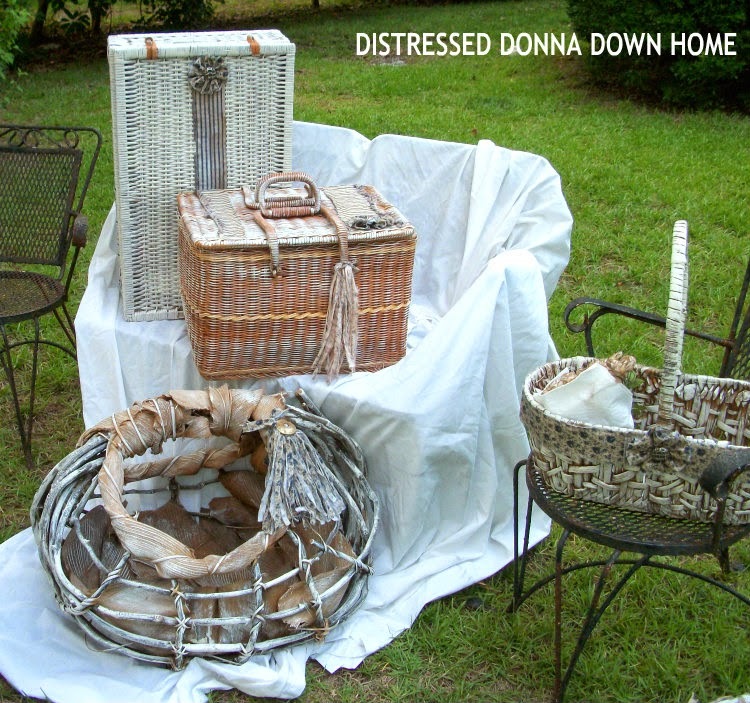 When my friend Donna at Distressed Donna Down Home invited me to take part in the blog tour that’s been making the rounds through blogland I just couldn’t refuse because it sounded like such fun. Donna and I share a love of vintage things, and she’s a thrifter extradonnaire. I always enjoy reading about the amazing things she finds… and what she does with them… because sometimes they really need some makeover love, like this beautiful Black Beauty here. and as far as I’m concerned she’s the tag queen of blogland. Check out this post here. Donna often uses pink, my favourite colour, in her makeovers and I just couldn’t resist showing you my namesake, Tuula the Pink Dresser, here. Too bad I live way up here in Ontario, Canada. If I lived closer I would have brought her home with me for sure. 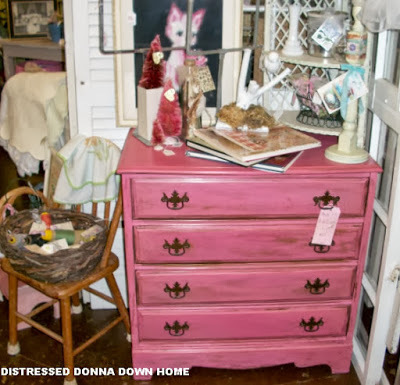 Donna has two booths at Riverfront Antique Mall in North Augusta, South Carolina. If you’re ever in the area pop in and check them out. 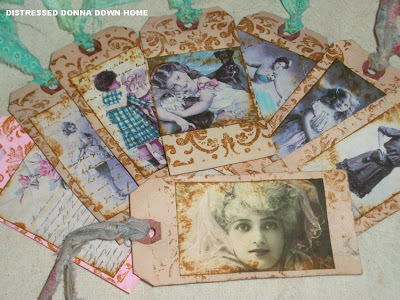 She also sells many of her cool vintage finds in her Distressed Donna etsy shop here. You can read Donna’s Blog Tour post here. So now on to my part of the tour. Here are the 4 questions I’m supposed to answer. First… I hope no one minds if I slightly rephrase the question to… What are you playing with right now? Decorating, DIYing, crafting, gardening, thrifting, and blogging are what I do for fun. It’s my play time, and when any of it stops being that I know I need to take a break. I’m always playing with colour, whimsy, and bling, and right now is no exception. 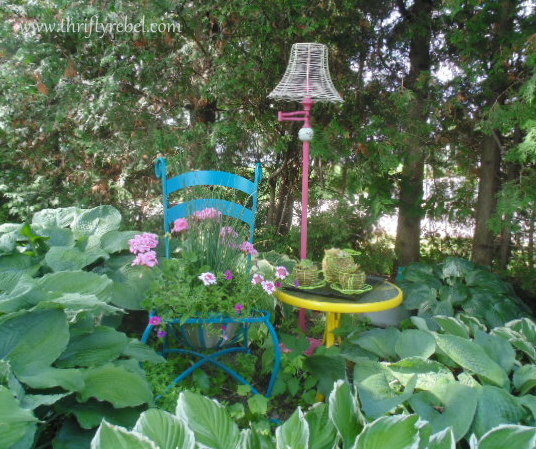 and I’ve been playing in the garden here with turquoise blue, daffodil yellow, watermelon pink, and lime green. for my etsy shoppe here. Right now I’m also salvaging perfectly good freebie lumber from the dump for a master bedroom project. I’ve challenged myself to make it for $0, and I can’t wait to start… but I still have a few more pieces to collect. How does your work differ from others of its genre? That’s a hard question to answer because I think each one of us is unique, and has a different perspective to offer. 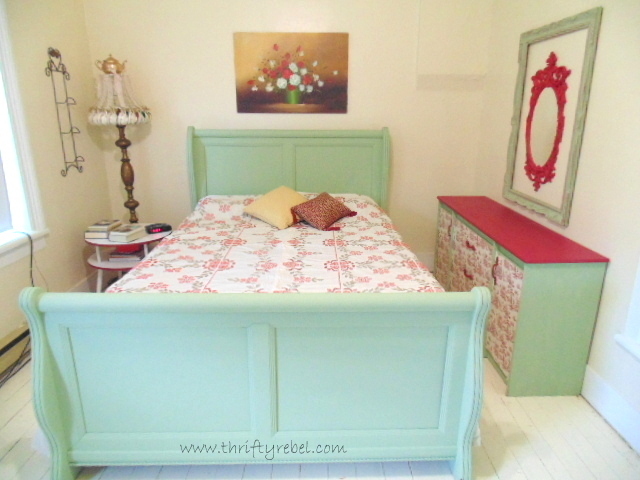 For me I guess it’s colour with splashes of whimsy… and just doing my own thing with no design/decor rules. Well that’s not entirely true… I should correct myself here… I do have one rule… to do what I love, and that’s it. I’m not the least bit concerned about being trendy… I only care about being happy, and I want things around me that make me smile and laugh. It’s more about how something makes me feel rather than just how it looks… if that makes any sense at all. Sometimes I’m attracted to the strangest looking things, but if they make me smile they’re keepers. Probably 99% of everything I do includes vintage and/or thrifted finds. 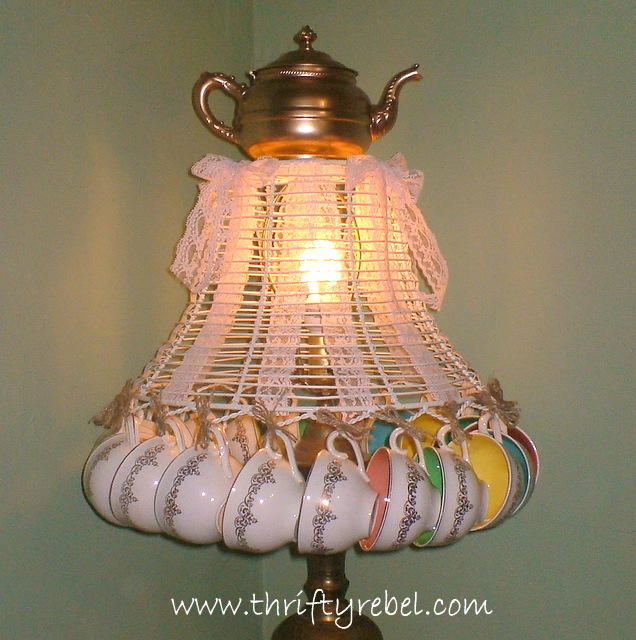 I love to reuse, repurpose, and upcycle things. If I can inspire just one person to look at ordinary things differently, or to not be afraid to decorate in a way that makes them happy… just because they love it… that would be the greatest thing. Why do you write/create what you do? It all comes from my childhood and the way I was raised. My parents were very creative DIY’ing thrifters/decorators/everything elsers, and I learned through osmosis. I was always encouraged to be creative. I started writing poetry and stories soon after I learned my ABC’s and I loved to colour and draw… sometimes on furniture, walls and floors. lol. I’m still writing poetry, and I’m still colouring on furniture, walls and floors… and ceilings too. When I was a little girl I would always get so excited when the Simpsons/Sears and Eatons department store catalogues came out with their Spring/Summer and Fall/Winter editions. I would design the house that I dreamed of having one day when I was all grown up. I would cut up the catalogues… taking the pictures of furniture, curtains, carpets, lamps etc… and design my house on pieces of bristol board. Then I’d add my own colour schemes and patterns with markers and crayons. I designed a lot of houses during my childhood years. I had so much fun creating my own little world… and I guess I’m still doing that. I can’t imagine living my life without creating in some way. I just need to. How does your writing/creative process work? The creative process is a complete mystery to me. Ideas just pop into my head and I either yay them or nay them. For me it’s important to keep a written list of ideas because I’m totally capable of forgetting them, even the ones I love. I have a full-time day job so not everything I do makes it to the blog, and I have to pick and choose what to post about. 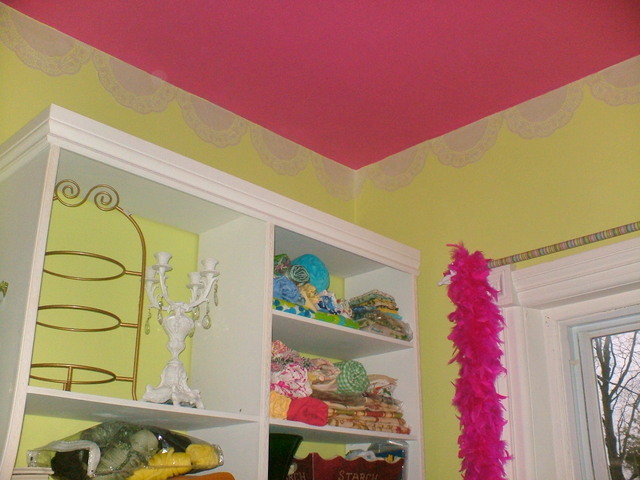 I often just do projects when the mood strikes me, and I’ve been known to temporarily abandon an ongoing makeover in one room for a project in another. As for my writing process I’m a very visual person. I usually see some form of the finished project or makeover in my mind before I create it… and then I have to try to figure out how to get there. It would be nice if these visuals came with instructions. Is that too much to ask? lol. I take a lot of photos and I use the photos as my guide when writing a post… and, memory permitting, I have a photo of every step. I often don’t have a complete plan for my projects and makeovers. I’m usually just winging it towards what I see in my mind. Sometimes they don’t turn out the exact way that I envisioned them, but that’s perfectly fine with me. It’s like taking a road trip with a destination in mind without using a map. Sometimes I might get a little lost along the way, but that often turns out to be the best part. It’s the creative journey that I love. Now I’m happy to turn the tour over to my friend Vicky from Life on Willie Mae Lane. I met Vicky when I took part in a Christmas gift exchange that she ran last Christmas and it was such fun. 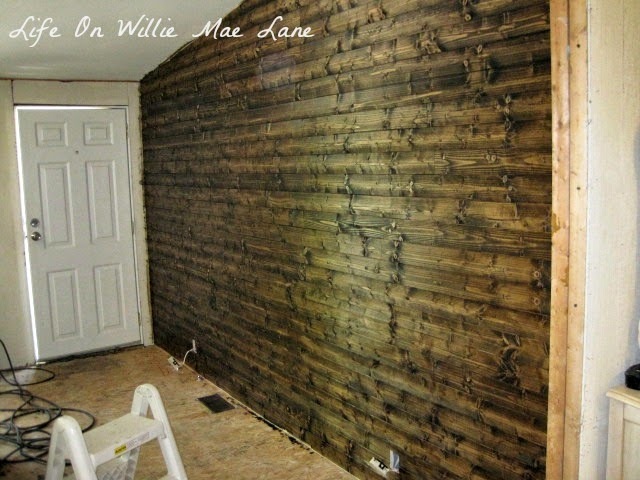 Like me she enjoys treasure hunting, decorating, crafting… and she’s working on some renovations right now that are pretty amazing… like this fabulous plank wall here. Hi, I’m Vicky and I blog at Life On Willie Mae Lane. I’m a Florida girl and married to the love of my life, Joey. We have two grown children. Miranda, 24, and Dakota, 19. We have several cats and a dog, our sweet Sadie Lou who just turned a year old. I am a kindergarten teacher and love, love, love my job! 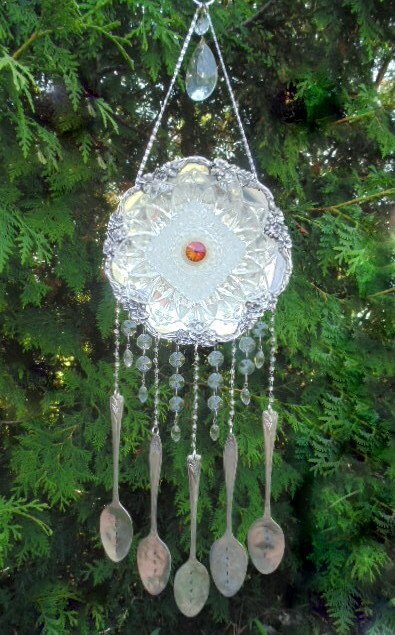 In my free time I love to shop for thrifty treasures, try out new recipes, craft, and create. 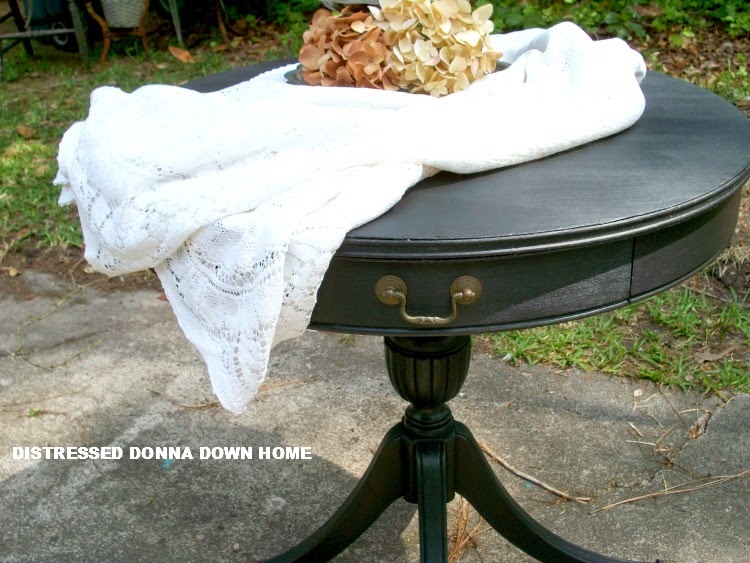 I absolutely love to redo some of the treasures I find and then decorate my home with them. Speaking of my home, I live in a double wide mobile home. The hubby and I have been busy renovating and remodeling and I would love for you to visit and have a look around. Hope to see you soon…until then, be blessed! 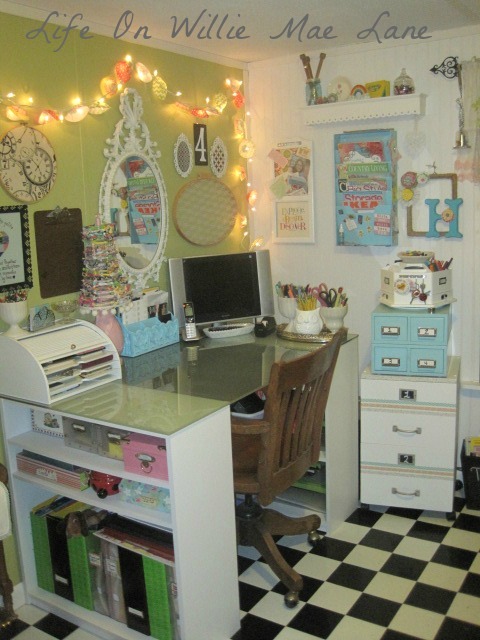 I just love her colourful craft room. I would be quite happy creating in there. Vicky will be posting her blog tour next Monday, August 18th, so be sure to pop over and check it out. You have an fun and creative blog…that's for sure! Now I will go and have a peek at your amazing friends! Cheers to a wonderful tour Tuula! First, thank you for such kind words, Tuula. 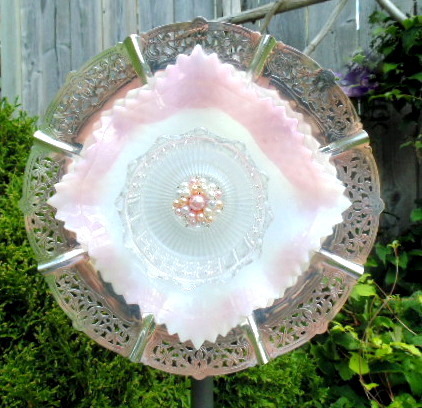 Second, I am thrilled you used the pink ruffled plate photo. 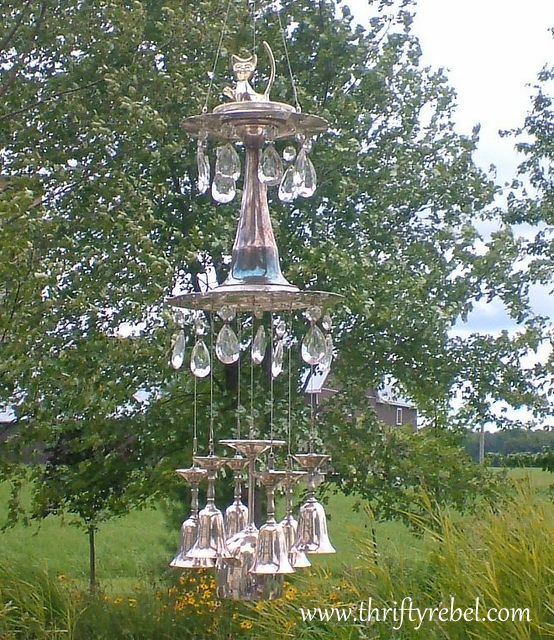 I love that piece of garden art. Found out a few facts I did not know about you. Thanks for continuing the blog tour. I look forward to Vicky's post. I had my tour today, too! You know, I had forgotten all about those catalogues, and I used to do the same thing! Sears and Montgomery Wards at my American grandmother's house, and Eaton's at my Canadian grandmother's house. I can remember that I wanted purple and ruffles. And lots of lace. Dang those day jobs! Tuula, it was fun getting to know more about you and your process! You and Donna are definitely the go to girls for anything pink. Tuula, you have been inspiring me for so long! Thanks for giving us a peak in to the whys of your beautiful, whimsy world!! Hi Tuula, how exciting to be on the blog tour! You are so creative and talented and I'm always curious to see what you are creating. I love Vicky and her blog and love how talented and creative she is too. Take care and enjoy your week. Very enjoyable blog post Tuula. Enjoyed getting to know you a little better and seeing the colorful, creative things that you do. I will be back to see more. Donna is also very creative and entertaining and she has been on my favorite list for a long time. Looking forward to visiting Vicky too. What a fun post Tuula, I really enjoyed hearing more about your journey. I know Vicky, so I'm looking forward to her Blogland Tour post next week. Loved this Tuula! Thanks so much again for asking me to be a part of it. I just got my post finished and scheduled to post Monday! Hope you have a beautiful Friday and weekend. Hey there I’m Tuula, creator of Color Me Thrifty, formerly known as Thrifty Rebel Vintage. I’m super excited you found me. I’m a repurposing, reusing, redecorating, redoing, rethinking, and DIYing kinda gal who loves to share budget-friendly projects for the home and garden. I hope I can inspire you to color a home that smiles. When it comes to creativity don ‘t be shy. Be fearless! Read more here. Color Me Thrifty is a participant in the Amazon Services LLC Associates Program, an affiliate advertising program designed to provide a means for us to earn fees by linking to Amazon.com and affiliated sites. All content on this site belongs to Color Me Thrifty (formerly Thrifty Rebel Vintage), unless stated otherwise. This includes all posts, tutorials, photos etc. that appear on this site. Any content from this site cannot be used without my consent, and must be credited to myself and this site with a link back to the original post on this site. Also, all photo watermarks must remain intact. Please see full disclosure here. You are reading and following the advice on this site at your own risk. All content on Color Me Thrifty (formerly Thrifty Rebel Vintage) is for inspirational purposes only. Please seek the help of a professional if you have any concerns about any project undertaking. This site is not intended to replace the advice of a professional. Please see full disclaimer here.